Intricate Weavings You Can Wear for Good Luck & a Great Look! 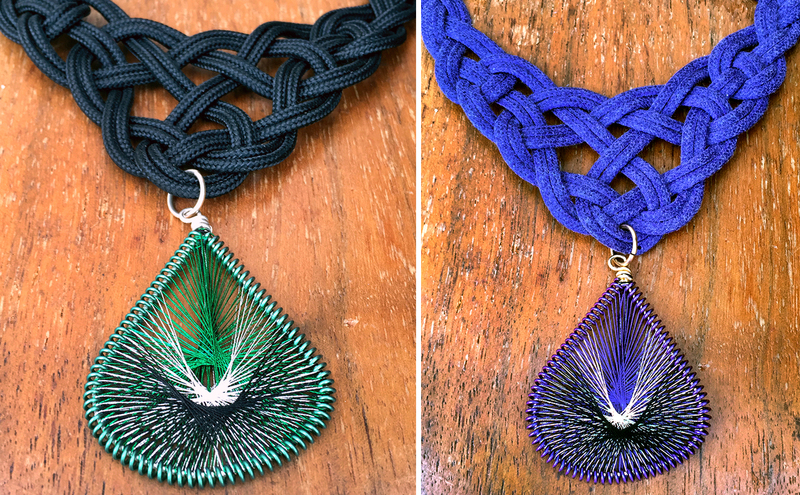 Complimentary & Contrasting Color Combinations In Wire & Thread. Inspiration: Latin American "God's Eye"
I started this blog around 3 years ago, and most of the artists featured here are ones I've gotten to know since that date. By funny happenstance, Natasha of Mandala Jewels is a maker I met way before I even I would follow this path. 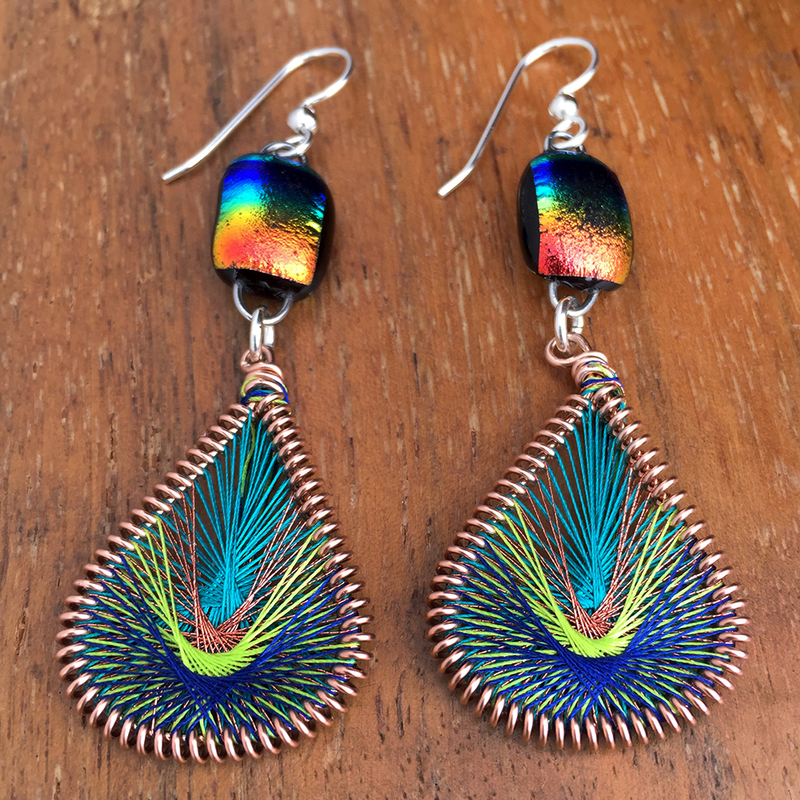 As a substitute teacher by day and an amazingly talented jewelry maker by night, Natasha first appeared in my life while I was in elementary school. When we met again 20 years later, I still remembered her by her jewelry. You don't forget the bright colors and intricate weavings like these! Every time I see her, Natasha has new combinations and even some unique collaborations with other artists. The concept behind her mandalas is simple - wire and thread, but the execution must be painstaking for the truly stunning effect she achieves. The way she loops and weaves each delicate strand of thread to create just the right pattern with layers of color, I honestly can't imagine! Once woven, each tear drop shaped piece becomes an earring or pendant. Some are embellished with beads or charms, while others incorporate the work of fellow artists like ones with Celtic knots forming the necklace band or handmade glass beads. 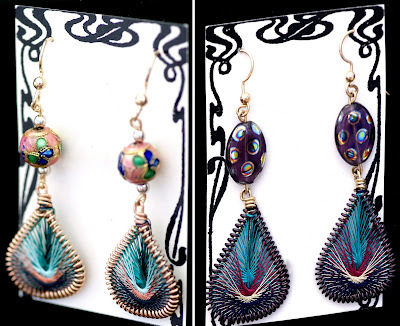 These mandala inspired jewels are very lightweight by the nature of the materials, but they are also quite striking. 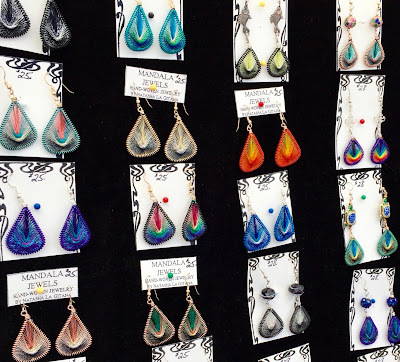 With her range of color choices, you can find a pair to match any personality or outfit. My trouble is picking just one that I like. Personally I am drawn to the pairs that make use of metallic thread, and she also has some using solar color changing string. You'll find Natasha at a variety of art events, but especially Renaissance fairs as is fitting for her style. I always keep an eye for the beautiful array of colors and characteristic pattern of Natasha's weaving!